Val-Kill is the 180-acre retreat approximately two miles east of Springwood, the Roosevelt family home in Hyde Park, that ER loved dearly. Two buildings sit adjacent to Fallkill Creek. Stone Cottage, the original cottage and home to Marion Dickerman and Nancy Cook, and a large two-story stuccoed building that housed Val-Kill Industries and which would become ER's home after FDR's death. In 1977, after a prolonged community campaign, President Jimmy Carter signed a proclamation making it the Eleanor Roosevelt National Historic Site, the only historic site dedicated to a first lady. 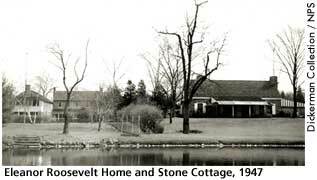 In 1984 the Eleanor Roosevelt Center at Val-Kill negotiated an agreement with the National Park Service and made Stone Cottage its home. Cook, Blanche Wiesen. Eleanor Roosevelt: A Life, Volume One. New York: Viking Press, 1992 325-327. Lash, Joseph P. Eleanor: The Years Alone. New York: W.W. Norton & Co. 1972, 172-173.